This series on City Guides is aimed at helping makers get acquainted with a city quickly. Maybe you’re new in town, maybe you’re traveling through, or maybe you’ve never ventured out into the maker community. Here you will find local sights and sounds, valuable resources for getting materials, tips on sightseeing, and other helpful things to know. This guide is a living document, so if you see something that needs an update, or if you’d like to help create a guide to your city, email us! For all the fanfare surrounding San Francisco and Silicon Valley, a lot of the creative and makery energy in the Bay Area actually lives across the water, in Oakland. From lively First Fridays and colorful murals to artists and tinkerers tucked away in studios, Oakland has something to interest every type of maker. Oakland is just a short subway ride from San Francisco by Bay Area Rapid Transit, and our weather is phenomenally better in the East Bay, too! The Oakland Shipping Cranes. 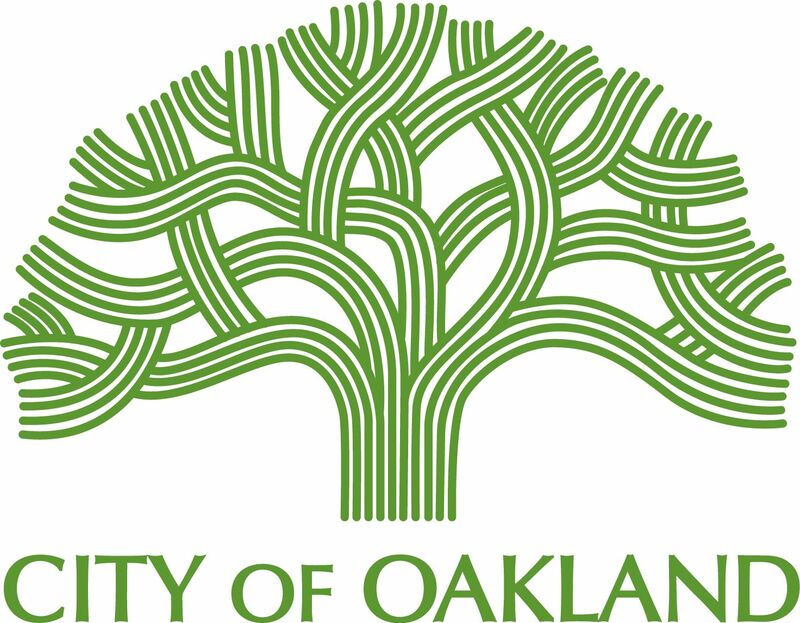 If you took a survey of Oaklanders and asked them what the city logo is, the shipping cranes would be high on the list, maybe second only to the city’s actual oak tree logo. They’re not an art installation, but rather a widely beloved and weirdly inspiring landmark that often makes appearances in art, apparel, and even tattoos as a representation of Oakland pride. Plus, they totally look like AT-AT’s. The 19th St Bart station features one of my favorite local art installations, called “Shifting Topographies” by Dan Corson (pictured below), which shows a large-scale topographical map of the local landscape, with colors that shift depending on time of day and nighttime projections. The Great Wall of Oakland — on a normal afternoon, the Great Wall looks, well, like a big empty wall. But it’s actually a 100’x100′ projection installation that featured local artists and is freely available for the general public to appreciate. If you have something you’d like to project onto a huge wall in the middle of a major city, you’re in luck. They have an open call for submissions through the end of this month. Children’s Fairyland — If you have kids in tow, Fairyland is a fun, whimsical mini amusement park located on the northern side of Lake Merritt. Not only is it the first themed amusement park in America, but the first amusement park specifically geared towards families with young children. Mountain View Cemetery — This cemetery is filled with beautiful sculptures and monuments, and a hike to the top will reward you with a gorgeous view of the entire Bay Area. Go in the morning and leave feeling energized and inspired for whatever project you embark on later. If you’re interested in learning the history of some of the more notable people buried there, docents lead free tours every other Saturday. Museum of California is full of art, history, and natural sciences. The Crucible is a non-profit arts education organization that fosters a collaboration of arts, industry, and community. Check out their Create program to learn about gaining access to tools and equipment during regular studio hours. NIMBY is a 65,600 square foot makerspace and self-described adult playground. American Steel studios provide affordable work space in which artists and innovators can create, produce and evolve and engage the local community on a multitude of levels. Their open house is on Tuesdays from 7–10pm. Liberating Ourselves Locally, or LOL, is a POC-led makerspace located in East Oakland with an emphasis on social justice, diversity, and community. Rock Paper Scissors Collective is a community arts space that’s all about sustainability and skill sharing. Sudo Room is a creative community and hackerspace with weekly Wednesday parties at 7pm. Tech Liminal wonderfully supportive hacker group that hosts lots of workshops, including a WordPress developers’ meetup and a STEAM Girls Camp. PLACE, or People Linking Art, Community, and Ecology, is a community focused on sustainability, urban homesteading, social justice, and more. Spokeland is a nonprofit bicycle education resource. Bring your bike in and find the knowledge and the workshop you need for your tune up. The Compound Gallery is an art gallery that also includes screenprinting, sewing, photography, and ceramics studios, plus digital fabrication studios and artist residencies. Tiny Splendor is a collective publishing press that produces prints, books, apparel, and zines. Ace Monster Toys is a membership-based group, but they have regular events that are open to the public, including an open house Thursdays at 7:30pm. Creative Growth is an arts center that serves artists who have developmental, mental, and physical disabilities. The Hive is an art and tech focused co-working space that hosts events and speakers. Counter Culture Labs is a community of citizen scientists focused on DIY biology, but open to science lovers of all types. Breakwater Makerspace is the world’s first nautical themed makerspace. Port Workspaces are a communal workspace designed by local makers Jillian Northrup and Jeffrey McGrew. Urban Ore is a bit like a normal thrift store on steroids. Described as “odd ball reuse,” you can find salvaged goods, furniture, building materials, used tools, old electronics, and more. While technically in Berkeley, it’s a quick car or bus ride from Oakland. Creative Reuse is similar to Urban Ore, with an emphasis on serving teachers and artists. Their mission is to divert waste by taking would-be junk and redistributing materials as low-cost supplies for art, education, and social services. East Bay Mini Maker Faire takes place in the fall. It’s definitely a lot smaller than Bay Area Maker Faire in San Mateo, but still equally as exciting and inspiring. First Fridays take place on the first Friday of every month, and stretch for many city blocks up and down Telegraph Ave. Check it out to discover local art, food, and music. Figment Oakland is a free participatory arts event in June at Mosswood Park. Gyroscope Inc is an Oakland-based design consultancy whose staff founded the STEAM Factory.